Those who follow this blog will know of our search for possible unnoticed articles by Stevenson in London magazine—ending up with a closer analysis of a list of 1878 payments for work on London, after which I concluded that I would need to look more closely at the four numbers of 13 July to 3 August 1878. R.-L. Abrahamson and myself had already looked through these numbers, but found nothing that we thought was even possibly by Stevenson, apart from ‘A Story-teller’ and a note on George Eliot (for 13 July), and notes from ‘a correspondent in Paris’ (for 20 July). We suspected that a poem on 13 July (from comments in a letter by Henley) might be by Stevenson, but we were interested in prose. To tell the truth, I was prepared to let it rest there: if whatever was in the 27 July and 3 August numbers had not been distinctive enough to be visible to us before, and there was no guarantee that another trip to London would be accompanied by sudden enlightenment. ‘I wish your C. B. would get a political fellow as good in his way as the author of Balzac’s correspondence and George Eliot’ (Demoor, 42–3). By ‘C. B.’ he meant the editor of London, Robert Glasgow Brown, who Lang thought was ‘Caldwell Brown’ (Demoor, 6n); by ‘Balzac’s Correspondence’ he is referring to the review article with that title in the second issue of London on 10 February 1877, p. 44. This is an article that R.-L. Abrahamson and myself identified as probably by Stevenson on our first look into London at the old Colindale Newspaper Library back in January 2013. It hasn’t previously been reported here—well, we’ve got to keep something for the album. When I saw Lang’s letter I thought: could he be indirectly praising Stevenson for the article on ‘Balzac’s Correspondence’—and for another on George Eliot too? That decided it: I had to go back to London to investigate this possibility for February 1877, and combine it with a closer look at the issues of the magazine for July and early August 1878. The cultus of George Eliot is one of the great social facts of the age. 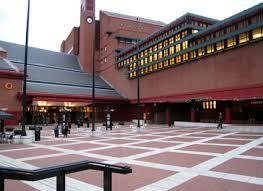 Its adherents include nearly the whole of the reading public. For purposes of generalisation they may be classed under three headings—Conformist, Disciples, and Sceptics. With very, very few exceptions, he [the Sceptic] knows that all of them [‘the gay young fellows it has pleased her to put forward as men’] have a comb concealed among their back-hair. Even women, who understand men so well for practical purposes, do not know them well enough for the purposes of art. Take even the very best of their male creations, take Tito Melema [in George Eliot’s Romola], for instance, and you will find he has an equivocal air, and every now and again remembers he has a comb at the back of his head. But the later passage in London must be Henley (who probably wrote the article) cheekily ‘borrowing’ from his friend’s recent essay. With no more internal evidence than this, we cannot take the article as by Stevenson. Lang letter: red herring. ripping! ‘great, excellent, stunning’ (first OED citation 1776). 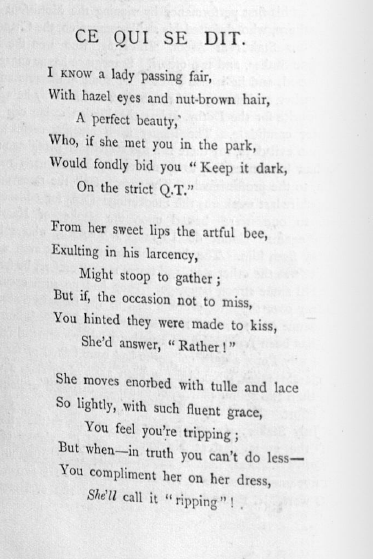 My guess is that this may have been about Fanny Osbourne with the last line a piece of American slang, that Henley changed to British slang (to make it presentable)—absolutely no proof, except that ‘You feel you’re tripping’ doesn’t fit well into the previous two lines and seems inserted to rhyme with ‘ripping’. Well, it’s perhaps not worth losing any sleep about, whatever the story is behind it. Subtracting the estimated payment for the ‘Arabian’ episode from the total payment, left me looking for a contribution of about half a column. The ‘Whispering Gallery’ section has three items of news from Paris, one in particular about the Jurors of the Exposition (and Stevenson was nominal secretary to one of them, Fleeming Jenkins). It starts ‘The Exposition has developed inventions undreamt of by the carnal mind of the casual observer. For instance, amongst the Jurors hospitality reigns’ (where ‘carnal mind’ could have a Stevensonian epithet). It goes on to mention that dishes with new names have been invented and gives a menu with items like ‘Potage. Emaillé de Printanier’ and ‘Truits. Patinée à Génèvoise’. This could be the Stevenson contribution—nothing earth-shaking, as you can see. Here, again, I was looking for something of half a column or less. And, again in the ‘Whispering Gallery’ section there is a contribution ‘from a letter’ that sounds as if it might be from Stevenson, containing a nonsense rhyme: Here, the French word béquille ‘crutch’ and béquiller ‘walk with crutches’ has clearly touched the poet’s funny nerve (maybe because a homophone béquiller (from bec ‘beak’) is a slang word for ‘eat’) and he creates a calque in English ‘to beckle’ which he repeats and varies in a crazy progression that threatens to extend to infinity. There is a good chance this is by Stevenson: it is from a letter (the origin of other contributions from Stevenson in this period), it involves play with French, which we often find him doing, the creation through use of a new meaning of ‘fulfilled’ at the end of the third stanza reminds one of Stevenson’s typical word-play, and Stevenson writes similar verse in other letters to Henley in this period (e.g. L2, 259). With that, I had more-or-less accounted for the four annotations of ‘an article also’ on the 1878 list of payments. That list, of course, only goes up to 10 August and it is possible that Stevenson continued contributing short pieces and poems after that. But this I generously leave to another researcher. In his “Andrew Lang”(1946), Roger Lancelyn Green says that in “London”, Lang, ‘besides a certain amount of unimportant prose, was responsible for a number of humorous ballades, such as “The Ballade of the Summer Term” (11th May 1878) and “The Ballade of the Three Graces” (25th May 1878), besides a few serious poems, including “Love’s Easter” (18th May 1878) and “The Last Maying” (27th July 1878).’ Green repeats the anecdote of Joseph Henley seeing Lang arriving in W. E. Henley’s office, where he ‘knocked off’ a ballade duly published in next week’s “London”, which appeared earlier in ‘W. E. Henley: A Memoir’ by Kennedy Williamson (1930). If the beckling poem is indeed by RLS it would not surprise me if it had one of RLS’s wondrous woodcuts planned to accompany it!